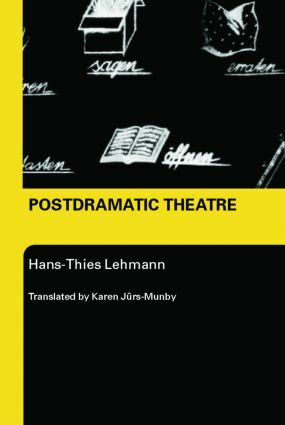 Newly adapted for the Anglophone reader, this is an excellent translation of Hans-Thies Lehmann’s groundbreaking study of the new theatre forms that have developed since the late 1960s, which has become a key reference point in international discussions of contemporary theatre. In looking at the developments since the late 1960s, Lehmann considers them in relation to dramatic theory and theatre history, as an inventive response to the emergence of new technologies, and as an historical shift from a text-based culture to a new media age of image and sound. Engaging with theoreticians of 'drama' from Aristotle and Brecht, to Barthes and Schechner, the book analyzes the work of recent experimental theatre practitioners such as Robert Wilson, Tadeusz Kantor, Heiner Müller, the Wooster Group, Needcompany and Societas Raffaello Sanzio. Illustrated by a wealth of practical examples, and with an introduction by Karen Jürs-Munby providing useful theoretical and artistic contexts for the book, Postdramatic Theatre is an historical survey expertly combined with a unique theoretical approach which guides the reader through this new theatre landscape. Hans-Thies Lehmann is Professor of Theatre Studies at the Johann Wolfgang Goethe Universität, Frankfurt am Main, Germany. His numerous publications include Theater und Mythos (1991) on the constitution of the subject in ancient Greek tragedy, Writing the Political (2002) and, with Patrick Primavesi, Heiner Müller Handbuch (2004). Karen Jürs-Munby is Senior Lecturer in Drama, Theatre and Performance at the University of Huddersfield.